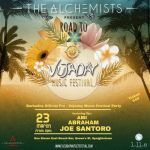 The countdown is on to Vujaday 2019 and The Alchemists are providing the official warmup party for the festival. Join them on Mar 23rd at their new home One Eleven East Beach Bar for an absolute banger of an evening... On the Road to Vujaday! During the event it will be possible to purchase tickets of the festival with a 15% discount.